If you're ambitious, make your own camera strap at Ikat Bag. If you're less ambitious or have fickle tendencies, just sew your camera strap a slip cover at Design Sponge. 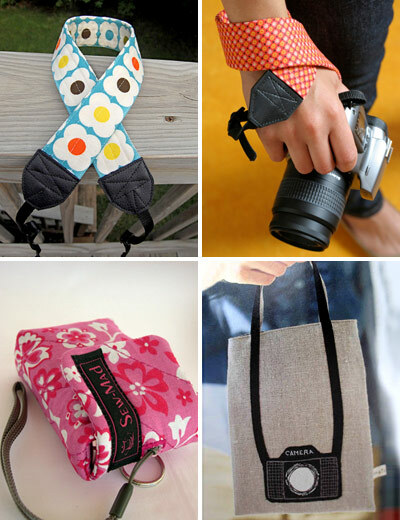 Make a small camera case at Sew Mad. Sew a tote bag with a camera graphic like this project from Stitch Idées magazine via Fototiller. No online tutorial, but you can use the photo to inspire your own. THANK YOU for this post. I've been meaning to make a pretty camera strap for a while. Off I go to lovely up my camera. Hooray for beautiful inspiration. How 'bout just sending me some ambition? I'm afraid I don't have any to spare at the moment; sorry! These are great! The camera handle would make a great gift for someone I know! Thanks for sharing! That camera tote bag is seriously cute, but I'm afraid that it shouts "Steal me - I've got a camera inside!" I do love the camera straps, tho. I've been meaning to make one to replace the scratchy nylon one that came with my camera. love all of these. Thanks for sharing!! Yay! Have been totally looking for some these-thanks! You read my mind!!! I bought a SLR camera last month and have been wanting to get camera strap slipcover... Thanks. I'll add that the Sew Liberated book has a pretty cool camera tote that I've been meaning to try. So far I've been wrapping up my fancy new camera in a sweatshirt - not good. Yay! Love it! Thanks for posting these!! Rachel, I hope at least it's a cool sweatshirt. That's the main thing. Those straps are awesome, thanks for posting! Too bad I see them right after I had my trip and my camera was looking kind of sad with a makeshift strap... I'm ambitious all right! I agree with the camera bag being seriously cute. Love that idea. Good post! I As much as I like "make for my kid" oriented tutorials I need a "make for myself" ones too! I've seen fabulous camera bags that mix fashion and function over at www.kellymoorebag.com. These would go great with those new camera straps! I just made a beautiful orange and cream colored one. I think you would love it. Thanks, once again, for inspiring me to add a little beauty to my everyday. Sooo great. Everyone, go see it!